We are closed Easter Sunday, April 21. Open Good Friday, Saturday and Easter Monday. No Pre-school class Monday, April 22. 1- We have added a new Intro class for 5 to 12 years old kids on SAT at 2 pm. 2- Spring Day Camp was a huge success - March 18 to 22, 2019. We will be offering a Summer Day Camp July 22 and July 29. More details to be announced. 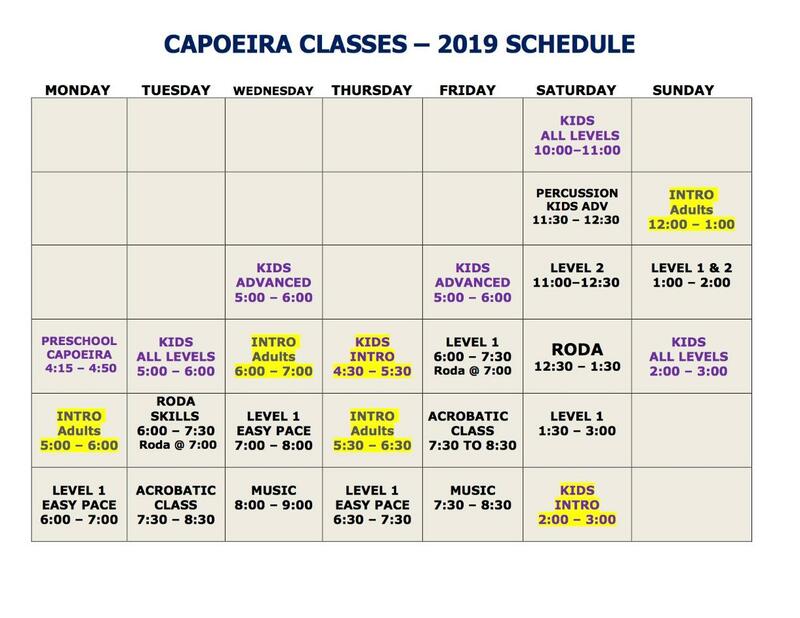 If you never took capoeira before, come to any INTRO CLASS that suits your schedule. You don't need to register first. Just show up a few minutes before, fill in the intake/release form and join us for your first free class. Students wanting to advance in Capoeira are required to attend Rodas - all rodas are free of charge. Roda is a circle where one plays capoeira. INTRO for Adults: First class is FREE. We suggest you take approx 12 to 15 Intro classes before moving to Lev 1 easy pace. There are however students that progress faster due to their background training, so you may speak with the Instructor and ask if you are ready to move to Lev 1 before completing 15 Intro classes. You may take INTRO as long as you want. And you may take Intro in conjunction with Lev 1 provided you have done the required amount of Intro classes. Drop in: $15 or buy 8 classes for $99 (expires in 6 months and for new students only). *Wear athletic pants and t-shirt to class. No shoes. You will train bare feet. Drop in: $20 or purchase packages of 4 classes, 8 classes or Unlimited with option to join for 1 mth, 3 mths, 6 mths or 12 mths. *Students taking Lev 1 and up are required to wear an abada (capoeira uniform). You may purchase one from us or bring the one you already have. First KIDS INTRO class is free. We offer 2 kids Intro classes (for kids that never took capoeira before). You don't need to register your child first. Just show up a few minutes before, fill the intake/release form and your child is ready to join his first free class. Our Intro classes for kids are: Thursday at 4:30 pm and Saturday at 2 pm. Drop in Fee: $15. After taking your first drop in class, if your child wants to continue, it will be required to purchase a package per month. We offer packages of 4 classes, 8 classes or Unlimited with the option to join for 1 mth, 3 mths, 6 mths or a year. These classes are for kids (ages 5 to 12 years old) that have some background in capoeira or have completed 12 to 15 Kids Intro classes. Checkschedule above for class times. New session starting: April 8 to May 20, 2019. First pre-school class drop in fee: $15. No drop in allowed after first trial class. You may join the session anytime after it started and pay pro-rated fees providing there are spaces available. Our sessions for the Winter/Spring are: Jan 7 to Feb 11 - Feb 25 to Apr 1 - Apr 8 to May 20 - May 27 to June 1. Further dates will be posted here. More info: info.achebrasil@gmail.com or cell: 778.838.9801.